The UK has more than its fair share of invasive plant species. Environmentalists have raised the red flag in hopes of increasing public awareness about these plants and informing the public what can be done to eradicate these destructive, non-native plants. 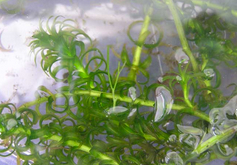 Curly waterweed is another non-native invasive plant that is threatening the UK landscape. This one appears subtle because it thrives under water. Classed as an “oxygenating plant” or “pondweed,” Curly Waterweed roots are not visible but grow as long as 3 meters, like Japanese Knotweed, and spread exceedingly rapidly. Like Knotweed, Curly Waterweed has spread across the UK wherever there are ponds, rivers, canals or lakes. The clutter caused by the plant’s underwater roots threatens native water plants and even game like fish. Unfortunately, Curly Waterweed impedes water flow in these fresh water sources. Despite being sold as oxygenating plants, this species is harmful to invertebrates. This is yet another non-native, invasive plant that was popularised by passionate gardeners who did not understand the ecosystem and risks these non-native plants can pose. This plant is quickly spread by birds and the wind and other animals. There are four types of Cotoneaster that are considered five-star critical risk under government’s Rapid Risk Assessment. Once extremely popular with gardeners, Cotoneaster is a favourite for birds and wildlife. Gardeners still view the plant as an appealing landscaping shrub. For birds, the plant’s berries are delicious, and this has helped spread the seed across the UK. Unfortunately, this species damages native species and crowds native plants out. 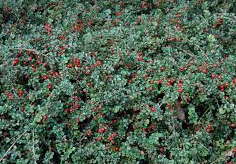 Chances are good that you can see evidence of Cotoneaster on limestone cliffs, bursting through pavement and screes or invading a neighbour’s garden. The species is stubborn and difficult to eradicate. Environmentalists won the first round of the battle with another non-native plant species when the sale of Floating pennywort was banned after April, 2014. 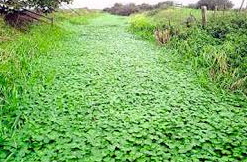 Floating pennywort is another invasive aquatic species that features dense mats of rounded leaves that appear to float across water surfaces. Giant hogweed climbs to heights of 6 meters, so it is difficult to miss this species. The height of plants in this species and the pointed leaves make this easily distinguishable from native hogweed, which barely reaches heights of 2 meters. 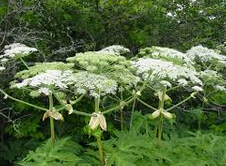 Giant Hogweed thrives on UK river banks and also spreads quickly in vacant lots in urban settings. The quick growth into dense colonies crowds out native species. Contact with the plants can lead to blistering of the skin due to the phototoxic properties of the species. If you are trying to eradicate the plant and come in contact with it, you may very well suffer skin aggravation and be forced to a dermatologist. Cover arms, legs and hands when working with Giant Hogweed. Giant Hogweed is classed on Schedule 9 of the Wildlife and Countryside Act in England and Wales. That means it is a violation to plant or otherwise encourage the spread of the plant species. For more information on controlling invasive species within your garden, commercial, or residential property, get in touch with TP Knotweed today. 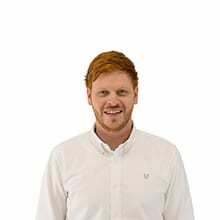 Next PostWhat Legislation Surrounds Japanese Knotweed?